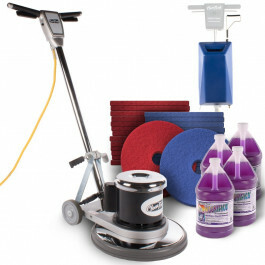 This floor package that we have put together is a complete package for scrubbing any type of hard surface OR carpeting. The floor machine is a 1.5 horsepower machine that can used in combination with the pad driver, pads, solution, and the solution tank included to scrub any type of surface that water will not harm. To sweeten the pot here, we throw in the 4 cases of pads for free! The polished floor machine comes with a 5 year warranty on the motor, and is a fully durable piece of machinery. 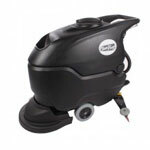 The pads spin at 175 rpm, which is ideal for scrubbing most concrete, and tiled floors. This package is very popular for small cleaning businesses due to it's light weight and portability. It comes ready to scrub smooth floors. If you have an uneven floor, such as unfinished concrete, please take a look at the additional floor scrub brushes we have available. Click on any of the links below to be taken to that products individual page for more information.